Experience the romantic sounds of LAs Song of the Angels Flute Orchestra making their La Jolla debut. Presented by The Depicted Vibrations, Vol 10. 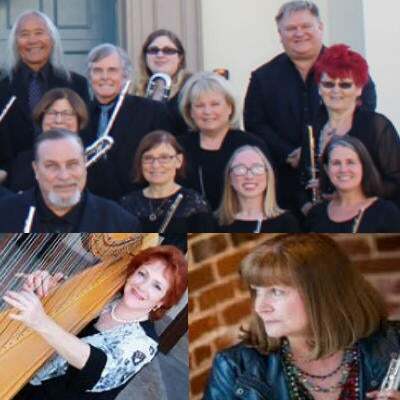 Featuring San Diego's Naomi Alter on Harp and with special guest Lori Bell on flute. Also featured are new works and world premier of La Jolla's very own composer, Chikako Iversen’s “Grateful Crane” Suite, “Meteor Shower”, and “Gold in Blue”. Held at the beautiful Congregational Church of La Jolla. Song of Angels Flute Orchestra: Founded by Frederick Staff and under the direction of Charles Fernandez, Song of the Angels Flute Orchestra is a Los Angeles-based ensemble comprised of flutes in all sizes – including piccolos, C flutes, Alto and Bass flutes, Contrabass flutes, F Contrabass flute (the only one in the world! ), and a Double Contrbass Flute (one of 4 in the world). http://www.soafluteorchestra.com.